Robin Preston’s March 2005 "Shot of the Week" article is truly a shot heard ‘round the world. In his own unique writing style, he referred to the current eBay pre-pro feeding frenzy as "March madness on steroids" and gently chided us for throwing away obscene amounts of cash in our feverish attempts to satisfy our glass lust. Robin’s comments can be analyzed and discussed on many different levels. Those buyers who pay premium bucks for glass might argue, "It’s my money, my hobby; if I want to pay that much, why should anyone complain? 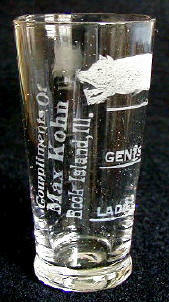 If anything, I am helping all glass collectors by raising the value of their collections!" Second, such wild speculation could lead to a complete market crash. Remember the Beanie Baby craze? Remember when people were paying thousands of dollars for "rare" stuffed animals, even paying many dollars more for the privilege of owning a pristine name tag entombed in a plastic protector? Hmmm, I wonder where that famous blue elephant is now? Or go back a bit further in time (and a bit farther in place) to the 1600s in Holland and the famous tulip craze. Back then tulips were a rarity, and only the very wealthy could afford them. Bedazzled by their beauty, the rich clamored for tulip bulbs, and a buying mania resulted. Prices for some "rare" bulbs rose to over $1,000 apiece! As prices climbed higher and higher, middle-class and poorer people got into the speculating act. They mortgaged their homes so that bulbs could be bought for resale at higher prices. The tulip crash came in 1637, when doubts arose as to whether prices could continue to increase. Almost overnight tulip prices collapsed, bringing financial ruin to many ordinary Dutch families. But enough about the shot glass buyer. How does the shot seller feel about this eBay spending craze? He or she is probably wishing that Robin would keep his cyber-mouth shut, as he is killing a good thing. But no, Robin isn’t. If anything, market madness risks killing only the golden goose. 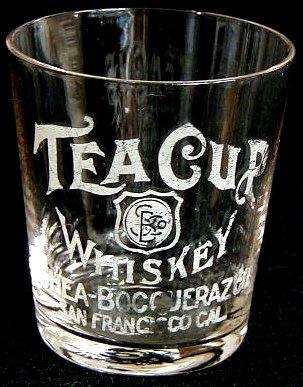 Yes, the eBay shot glass seller of today may be enjoying record profits, but those dollars may be only short term if collectors get discouraged and quit, leaving only a few people left to buy the George Truog Eyeopeners and any picture glass lucky enough to bear the words, "San Francisco." When everyone who wants them has these glasses, who will buy the remaining ones? One need only search "Hummel" on eBay to realize the potential impact of these words. Everyone who wanted these "limited edition" figurines ordered them during the sculptures’ one hundred firing days. This meant that everyone who wanted a "little girl with umbrella" bought one while they were still being made. Sure, the mold may be broken now, but it makes no difference; the market is glutted with tons of baked clay that no one else wants. (I have two sons, and luckily, both of them would like to inherit my collection some day. But my wife has a few Hummels, and my sons never cease to raise her ire by commenting, "Okay, when mom and dad are dead, who has to take mom’s stuff)? So what is the new collector to do when eBay prices get goofy? Simple. Don’t participate in the Market Madness! In the last few columns I have described several ways in which one can collect glass, have fun, and not steal from the first born’s college fund. You know, I do not pretend to have Robin’s knowledge of shotglass market analysis, but I am willing to bet that I am not totally off base when I say that to a degree there is an inverse relationship to glass rarity and glass demand with more than a few pre-pro shot glasses. In any given month of late there has been at least one George Truog picture glass for sale on eBay, yet demand for George Truog remains high. 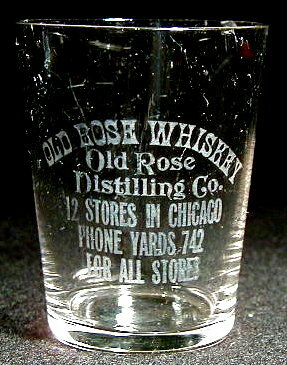 On the other hand, I have a battle-scarred "Old Rose Whiskey" from Chicago in my collection. It is all text, no picture, and so I paid very little for it on eBay, yet when was the last time you saw it listed on the auction block? This glass is probably fairly rare, but there is very little demand for it. 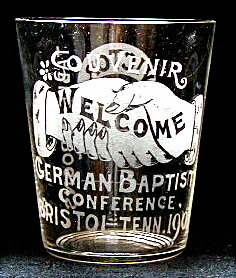 There are probably more George Truog autographed German Baptist conference glasses out there than Old Rose Whiskies, but GT gets all the glory. Go figure. I could list several other examples, but you get the idea. Earlier I mentioned the Hard Rock Cafe glasses. I have been told that countless people avidly collect these. We pre-pro people may turn up our collective noses and sniff, "modern garbage," but you know, I bet that there are tons more HRC collectors out there than pre-pro collectors. So what is the HRC attraction? I think that many people like collecting something that is fairly uniform in size, is basically alike, but can still be differentiated by a limiting distinction, such as the name of a city or town. A HRC collector can have a cabinet of glasses, all the same size, all the same logo, but all be different, and all be reasonably priced. They can tell their friends (or their long-suffering spouses), "Yeah, I have the Chicago and Toronto in this style, but I am still looking for a London and a Vancouver and a Hong Kong. . . ."
Pre-pro collectors have their own version of the Hard Rock Cafe glass that they can collect. I recently discovered a series of "sleeper" glasses that I am having an absolute ball collecting. 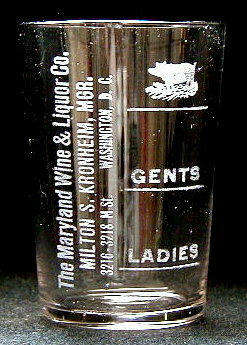 It is the "Ladies/Gents/[Hog]" glass that bear a company’s name and address. The glasses that I have so far are all fairly uniform. They are either tall shot glasses or tonic glasses. As I said, they have the words "Ladies," "Gents," and a picture of a pig or hog on them. Next to this montage is the familiar acid etched writing of an advertiser. As you can see, these glasses are pre-pro’s answer to the Hard Rock Cafe glasses. They are all fairly uniform in appearance (the text directly adjacent to the graphics makes them display rather well), but none are exactly alike. They are defined by their geography, just like the HRC glasses. They are all similar, but they are all different. Right now the collecting field for these glasses is wide open. That is, one can collect them without spending a lot of money. With two out of my five being unlisted in the pre-pro database, it seems quite possible that there are a significant number of "unknown" glasses out there, waiting to be discovered and catalogued. 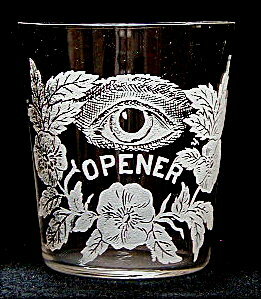 Thus, by collecting this glass variant, there is the added benefit of contributing to our collective knowledge of these advertising glasses. If shot collecting ever advances to a stage where we actually have glass shows with exhibits of glasses, I would think that a display of just this type of glass would be an awesome sight to behold and could actually win a "best of show" award. Or at least the "People’s Choice." It is clear that any collector, whether a grizzled veteran or a wide-eyed newbie, does not have to rob a bank in order to enjoy collecting pre-pro glasses. What one does have to do is have patience. Market madness is just a temporary thing. It will pass, and as it does, prices will stabilize. Meanwhile, add "hog shot glass" to your list of eBay favorites, tell George Truog to get lost, and have some fun! Better yet, why not tell eBay to pound sand and buy a glass from a dealer instead? Both Bruce Silva and Jim Dennis advertise on this site. (I just bought the Olson Company glass from Bruce.) We are lucky to have Bruce and Jim and other mail-order vendors as an alternative to eBay, but if we don’t patronize them, they may just decide to cast their fate to the eBay winds instead. Copyright © 2005 pre-pro.com. All rights reserved.